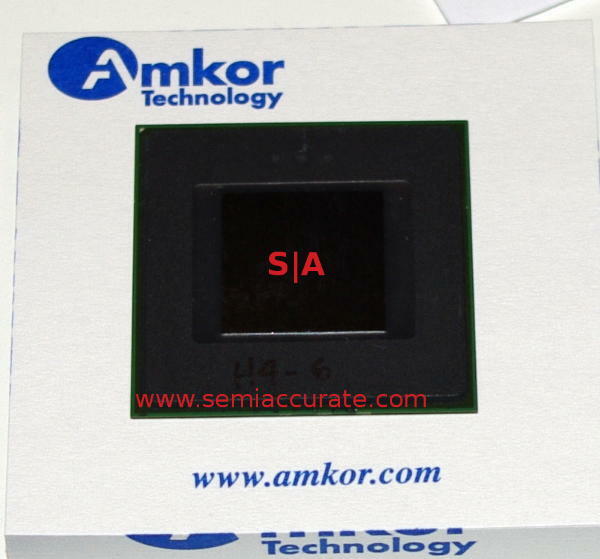 Amkor was showing off a package type I hadn’t seen before called FCmBGA at LSI’s AIS. This Flip Chip Molded BGA technique isn’t exactly new, but it is interesting. The idea is simple, take a normal Flip Chip (FC) package and instead of putting underfill under the die, use that grey plastic molding compound you normally find in wire bond packages. You don’t stop there though, extend the compound out to the edges of the substrate at a height roughly even with the exposed die. It looks like an old school chip with the top machined off as a demo, like this.